President Michel launches his new book "Island Nation in a Global Sea: The Making of the New Seychelles"
On the anniversary of his 10 years on office, President James Michel has launched his third book, entitled Island Nation in a Global Sea: The Making of the New Seychelles, during an evening reception at State House today. ".. I have drawn on a selection of my speeches and these are included in the volume as well as the narrative. Yes, in part this is a story of my own presidency. But it is, no less, a story of the part played by all Seychellois. 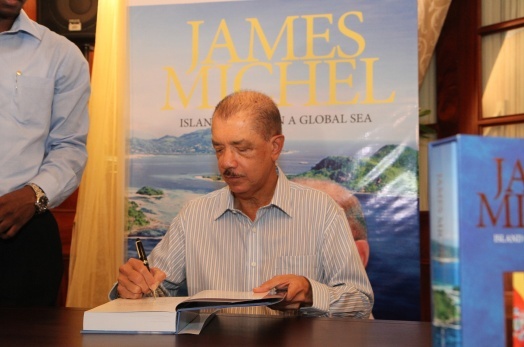 It tells of how far we have come in embracing and confronting the challenges of globalisation, of how far we have come along the road to the New Seychelles," said President Michel. He added that the book charts the history of Seychelles in the modern world, as an island nation with an international reputation. "It is about the transition of our nation to a knowledge-based economy. It is about the responsible use of the ocean’s resources. It is about responsible and transparent government. It is about the reinforcement of our democratic institutions. It is about national unity and harmony. I look back to the past ten years but also forward to the future. The story continues to unfold. And I have no doubt that you will continue to be part of it." During the book launch, a respected lawyer and politician, Bernard Georges, introduced the book saying that while he has been a political opponent of the President, "when all is said and done, it is far better to build bridges than to dig trenches," and said that the new book serves a purpose for being an important record of the last ten years in the history of the nation.
" It serves to nail you to a particular benchmark..(..)..This benchmark will serve as a pivot for two things- for those who wish to build on your ideas to have a foundation on which to work to, but no less important, for those who wish to criticize your methods to have a reference point for doing so. Both are equally important for it is the lot of the politician and leader to stimulate bother followers and detractors to greater things, for the greater good, " said Mr. Georges. Mr Georges noted that the President had said 'the past is history' in his book and Mr Georges said that together as a nation, we should confront history, to make amends, heal wounds and draw lessons from it.
" Let us focus on the future, you say. Yes indeed. Let us together use this moment, this book launch, this anniversary to commit ourselves to that task." The launch event was attended by former President James Mancham, Vice-President Danny Faure, a great number of dignitaries as well as friends and family of the President. The 400 page book will be on sale in Seychelles in the near future.